A very low-salt food is considered to be one with less than 35 milligrams of sodium per serving, according to the U.S. Food and Drug Administration. Many modern diets have too much salt, which can cause high blood pressure. Switching to a diet focused on whole, fresh food can easily create a diet full of low-salt foods. The salt limit for people without hypertension is 2,300 milligrams per day and the limit for individuals with hypertension is 1,500 milligrams per day. Oatmeal is an excellent no-salt food for either for breakfast or as a snack mid-morning or mid-afternoon. Instant oats, whole oats and steel cut oats in several brands have no salt. 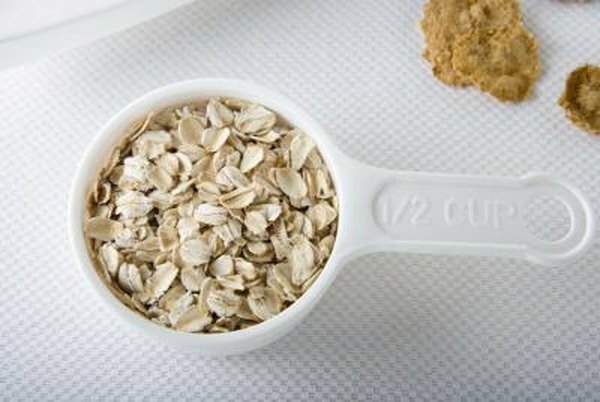 Oatmeal is filling and is also an excellent source of fiber. A study in the 2009 “Circulation” journal assessed the relationship of fruit and vegetable intake in participants with high blood pressure. For each serving of fruit or vegetables added each day, there was a 6.2 percent improvement in blood pressure. Fresh fruits, such as apples, bananas, cherries, apricots, strawberries and blueberries all have less than 35 milligrams of salt in a 1-cup serving. Since the salt is less than 35 milligrams, this is a very low-sodium food and healthy choice for any time of the day. Canned and dried fruit have a little more sodium, so it is important to read the label for these types of fruit. Beans are another low-salt or no salt-option. Dried or raw beans should be prepared with no added salt. Choose canned beans marked as "low sodium" or "no sodium" and rinse them in a colander to remove any additional salt. Typically, a 1/2-cup portion of beans has less than 35 milligrams of salt, which makes beans a very low-sodium choice. Eating fresh tomatoes is the healthiest and has the least sodium. Canned tomatoes can be found with 35 milligrams of sodium or less as crushed, diced, chopped or in paste form. The key is to read the food labels for versions marked as being low in sodium or having no sodium and to monitor the portion size. Whole-grain bread and bread mixes tend to be lower in sodium than others.The sodium can add up quickly the more slices you eat, so make sure to read the nutrition label for the serving size. Most loaf-size breads have a serving size of one slice and some do have less than 35 milligrams or less of sodium per slice.